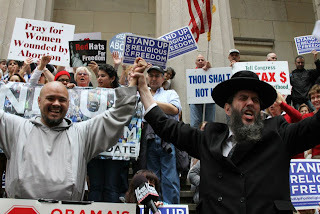 Chillul Hashem by Touro | RabbiLevin.com - Fighting for Morality! I am writing to convey my utter dismay and disillusionment with Touro College for selecting Judge Judith Kaye as its June 4th Commencement Speaker. Judge Kaye officiated at a high profile same gender marriage this past weekend involving NY City Council Speaker Christine Quinn. Furthermore, she was instrumental while on the bench, in actively setting the legal groundwork for the eventual passage of the N.Y.S. same gender marriage law. While on the bench of the New York State Court of Appeals, and presiding as Chief Judge, Judith Kaye was a key decisor in the case of Levin vs. Yeshiva University which ultimately forcedAlbert Einstein Medical School to admit same gender couples into its marital dormitory. Judge Kaye even went so far as to write her own concurring opinion in that case in which she expressed the idea that the maintenance of separate dormitories for married couples could, by itself, constitute “discrimination”(!!). In my estimation, it constitutes a grave Chillul Hashem for a Jewish institution such as Touro which touts its Torah values, Rabbeim and Bais Medrash system, to select as commencement speaker, Judith Kaye, whose values and persona are antithetical to the basic Torah precepts of kedusha. This trespass is all the more egregious when one factors in that the graduates and their families may be predominantly Orthodox. This should be all the more self evident at this late stage of the devolving culture. Educational institutions such as Touro who cater to Orthodox students are ethically bound to carefully discriminate as to who they permit to inspire their students. Touro must be cognizant that many within and without of the Orthodox community will infer that the Torah community couldn’t care a whit about the issue of same gender marriage and all the attendant issues of this nefarious agenda (i.e. adoption, education, the military, etc.). After all, this isn’t a politician to whom some will still mistakenly claim we “owe” something and thus we must countenance honoring them. There must be hundreds of success stories in our community who could be appropriate commencement speakers; men who represent the finest of Torah Im Derech Eretz, and who would be appropriate role models. Doesn’t Touro’s choice of Judith Kaye act as a non-verbal communication that she is somehow “kosher” as even a “partial” role model? To this I protest and declare: Chas V’shalom! In Yiddishkeit, we don’t bifurcate like this. Half kosher is entirely “treif”! I don’t believe that the late Dr. Bernard Lander a”h would have taken such an insensitive and anti-Torah action. If he did, he would surely have apologized to the Torah community. I hope the current leadership of Touro will do the same. As for me, my attitude towards Touro will certainly be: respect but suspect.